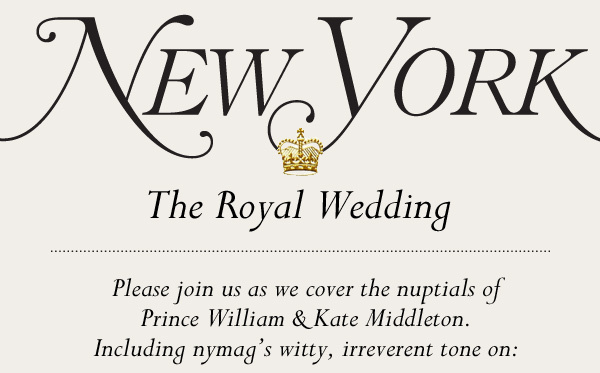 I see that, according to Lauren Collins in the May 2 New Yorker, HRH is known to Miss Middleton as "Big Willy." on the palace balcony with their families and have their first public kiss. Prince William and his brother and best man, Prince Harry, leave Clarence House for Westminster Abbey, the site of the wedding. The groom's father, Prince Charles, and his wife, Camilla, the Duchess of Cornwall, leave Clarence House for Westminster Abbey. where they were married in 1947.
century-old, family-owned hotel blocks from Buckingham Palace. in 1066. Fifteen previous royal weddings have taken place in Westminster; the last was Prince Andrew and Sarah Ferguson in 1986. About 1,900 guests have been invited to Westminster Abbey for the wedding ceremony. The newly-married couple leaves Westminster at the head of a procession of five horse-drawn carriages to Buckingham Palace. William and Kate will ride in a 1902 State Landau coach that is frequently used during state visits and for royal weddings. by a dinner for 300 hosted by Prince Charles. While the newlyweds and their families greet well-wishers from the balcony, Royal Air Force planes will fly over Buckingham Palace. Tornado and two Typhoon jets. fly over Buckingham Palace on June 12, 2010. O ... K. ... That's the time I usually get up. Maybe I'll get up a little earlier tomorrow. Sounds like the seating chart is fair and respectful to all the families. Wonder why Diana's mother doesn't appear to be attending? Maybe I'm wrong, but I thought she was still alive. Frances Ruth Burke Roche Shand Kydd (née Roche, formerly Viscountess Althorp) (20 January 1936 – 3 June 2004) was the first wife of John Spencer, 8th Earl Spencer and the mother of Diana, Princess of Wales. After two failed marriages and the deaths of two children, she devoted her later years to Roman Catholic charity work. She died on 3 June 2004 following a long illness that included Parkinson's disease and brain cancer, aged 68. Her funeral at the Roman Catholic Cathedral in Oban on 10 June was attended by many of her children and grandchildren, including Princes William (who gave a reading) and Harry. Their father, her former son-in-law, Prince Charles, did not attend because he was en route to another funeral—going to Washington to lead the British delegation at the state funeral of former U.S. President Ronald Reagan the following day. Kate's Mystery Designer — Is It Sarah? Mystery solved? Not quite yet. Web sites began burning up Thursday with images of a purported Sarah Burton checking into The Goring Hotel, where Kate Middleton and her family are staying. If accurate, the spotting would seem to confirm that Alexander McQueen’s Burton — despite numerous denials — has designed Middleton’s much anticipated gown for Friday’s royal nuptials. Another possibility is that Burton could have designed Middleton’s dress for the evening gala Friday night for 600 people at Buckingham Palace. 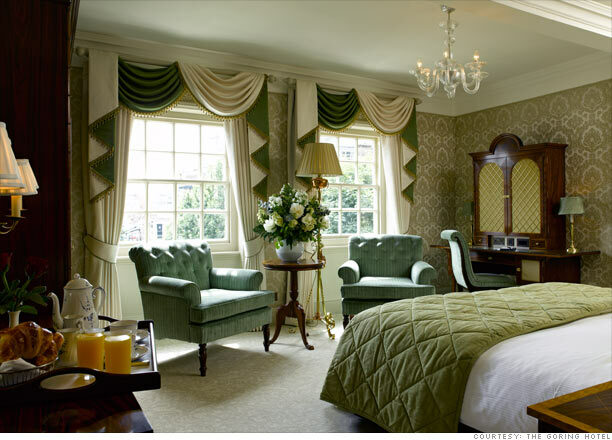 The Goring Hotel is a last-of-its-kind hotel. It's been in the same family's hands since O.R. Goring opened it in 1910. Kate is spending the night before the royal nuptials at the iconic hotel. Kate Middleton and her dad Michael will leave the Goring precisely at 10:51 a.m. for Westminster Abbey on April 29.
on them the moment they leave. private garden, has two bedrooms and bathrooms, a drawing room and a dining room with a baby grand piano. Duchess of York, and members of the royal families of Denmark, Greece and Lichtenstein. unlike the palace next door. according to rates published in January. 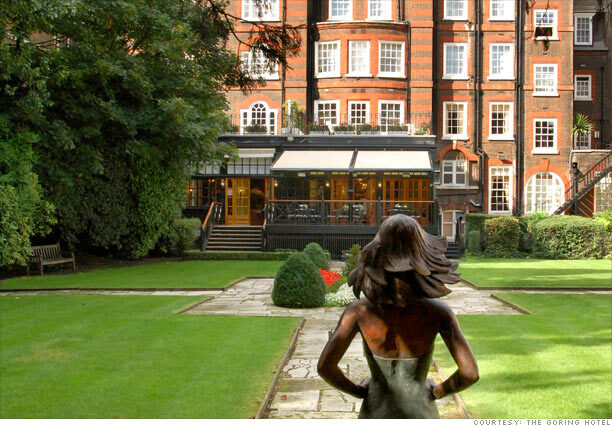 The royal wedding is expected to raise the global profile of this family-run luxury hotel. I am on the Titanic. It has begun to snow, but there is no iceberg in sight. In the Empire-inspired red lacquer bar, I am seated deeply in a handmade leather arm chair. I feel only the warm undercurrent of good manners, good will and a sway toward a staff whose attentiveness borders on telepathy. Champagne and cognac, which costs a King's ransom, flow freely. A server appears with exquisite canapés. Guests speak quietly in the Queen's English. Their ease suggests they are at home among friends on a wintry evening. It is my first evening in an inner sanctum favored by Royals, Prime Ministers, Ambassadors and international Presidents who covet a gentility that suspends time. The bar's elegant maitre de shakes my hand 'good night' as I prepare to return to my room, a distance marked by shining marble floors and carpets that smell of lemon. I turn the key. The interior lights have been dimmed to the setting "Cozy” by the housekeeper, my bed has been turned down and a box of Sir Hans Sloane of London chocolates placed on the nebulous cloud that is my comforter. The ivory ruffled curtains have been drawn. In the dim light the silk walls are a muted deep salmon, a color selected from the archives of the Gainsborough Silk collection of the British Embassy. Graham Copeman, the cherub-faced General Manager, had shown me another "Silk Room,” one done in royal blue, the same color as the interior of the Queen's carriage, he pointed out, "so the next time you are in Her carriage you will recognize this color." He smiles. Every Prime Minister since Winston Churchill has been a guest at the Goring. The Royal Family has entertained in its private suites. 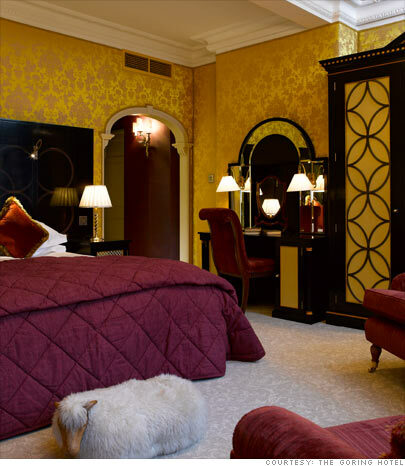 The Goring has, in fact, acted as a sort of annex to Buckingham Palace since it has always supplied personal luxury en plus. As the King of Norway put it in the late 1930s, “I prefer to stay at the Goring since at the Palace I do not have a private bathroom.” The Goring was the first grand hotel in London to install a bathroom in each bedroom and use central heating. It is the last of the great Victorian hotels, King Edward having died months after its opening. And yes, this is where I am installed, not on that ill-fated luxury liner reminiscent in style and grandeur but on terra firma that has been in the Goring family for four generations. My room, priced at 499.00 GBP, is best described as delectable. It faces the formal garden, the largest private garden in London apart from the Queen's, “but we allow Her that, given who She is,'” the Front of House Manager told me. In the morning, when I open the curtains, I see a whimsical sculpture of a dancer coated with frost. Word has it that she dances if you have imbued sufficient quantities of champagne. 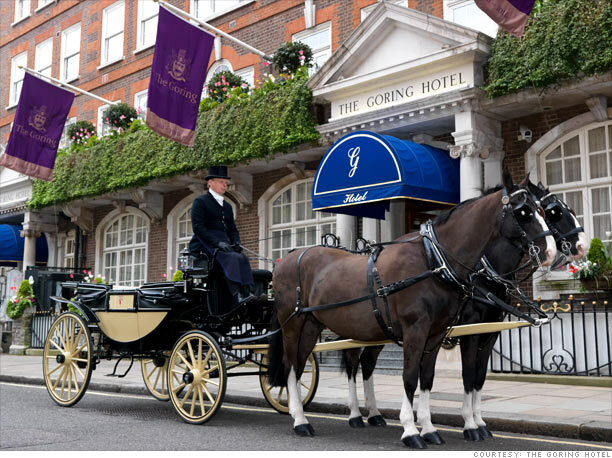 This year, London’s only family-owned five star hotel is celebrating its Centennial under its dashing CEO Jeremy Goring. The hotel prides itself on the longevity of its good name and its staff whose ethos is most evidently one of personalized service. One of the doormen has been at his post for 43 years. Most of the senior staff have spent at least 20 years at the hotel. Copeman says, “We are like a family and we treat our guests like family." One frequent visitor (neither a Royal nor a President) told me he had been gone for a year, but on his return the doorman welcomed him back by name, and his “usual Campari and soda" was waiting for him at the bar. 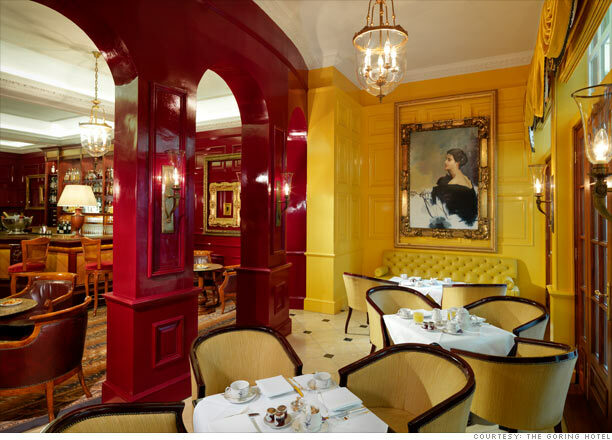 Life changes but not at The Goring. Certainly there has been the recent refurbishing orchestrated by Lord David Linley, the Queen's nephew, with the artistry of Tim Gosling, affectionately known as The Goose, but renovations have largely conformed to original photos, particularly in what Copeman calls “the most beloved public room, the Sitting Room.” Gilt now overlays the domed ceiling and newly handwoven carpets have an antique patina. Carved moldings have been restored. The most dramatic change is in several bedrooms designed by Nina Campbell, with free-standing bathtubs and sophisticated hand painted wallpaper. Lord Linley's remodeling of the Dining Room has added a sense of spaciousness but the eye goes directly to the free form Swarovski crystal chandeliers in dazzling blue. During its Centennial, head chef Derek Quelch (formerly of Claridge's) is featuring on the menu a dish favored during one of the “100 Years of Glorious Goring Grub;” to wit: Mrs Goring's Pig's Fry Salad with poached Duck Egg, served during The War Years. Inventive, yes. Haute cuisine, that too. 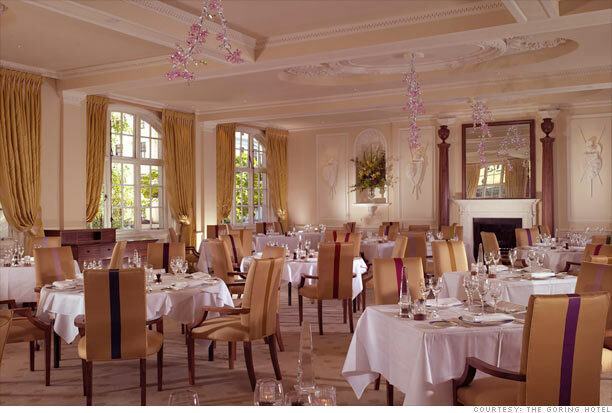 Last year the Reunion des Gastronomes voted the Goring's menu, the “Menu of the Year. Don't eat a large lunch if you plan to take Afternoon Tea, which won The Tea Award of Excellence by the British Tea Guild Council. Three tiers of delicacies commence with an amuse-bouche (perhaps lobster in cream) , then it's on to classic scones and thick clotted cream, finger sandwiches, cream pastries and the Goring's signature "Not a Trifle," a sponge cake drenched in liqueur. Tea is taken in the amber-swagged atrium, where one might spot a knighted actress or the wife of a Prime Minister. The Goring won't disclose names; it guards its guest book as it does its reputation. Leaving is difficult. An heiress faced the same dilemma in the 1930s. One night was just not enough. She decided to stay on, for 30 more years. As time passed her girth broadened and it took a trio of maids to extricate her from her bathtub. The day she was carried out on a stretcher she paused, with her last breath, to thank each member of the Goring staff for their kindness. 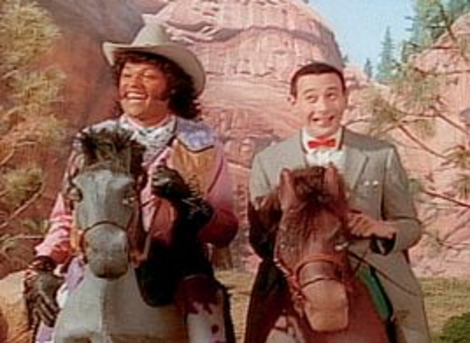 "You have to bring your utility bill and a passport or drivers license to get in. You need your utilities bill because that has the address on it the invitations were sent to." 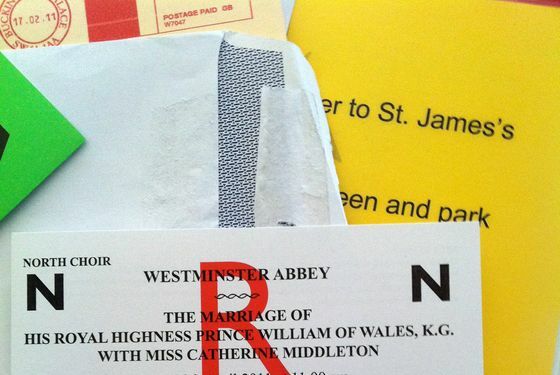 A real live royal wedding ticket! The streets around Westminster Abbey are officially an unwalkable sea of red, blue, and white. Police have put up barriers around the campers on the sidewalks to create makeshift walkways and are out in full force to keep people moving in one direction (half of them seem to be us Americans — you're welcome, London). Cars and buses are still inching along at the same pace as the pedestrians; while most are filled with frustrated drivers, we did spot one neon yellow vintage Rolls Royce decked out in British flags and a convertible filled with a family all holding flags and waving. Meanwhile, security around Westminster is quite noticeably more intense. Police are stationed everywhere to make sure people know where they can and cannot walk. We found one dude in a pub just a block away who seemed shell-shocked by the crowd: "I work just around the corner and this street is normally completely empty at this time of night," he said. We also found a couple who were invited to the wedding! And will actually be inside Westminster Abbey tomorrow, breathing the same air as Kate and William, craning to see The Dress in person around all the hats. Security is very tight, the wife explained: "You have to bring your utility bill and a passport or drivers license to get in. You need your utilities bill because that has the address on it the invitations were sent to." She showed us the personalized ticket guests must also present and the separate invitation to the VVIP dinner that will take place at Buckingham Palace in the evening. After the wedding and daytime reception their game plan is to dash home to change into their evening gear for the nighttime party at the palace (she's also heading to her hairdresser to undo the effects of seven hours of wearing a hat). It's unclear how they'll deal with the traffic between the afternoon and nighttime receptions. After the ceremony at Westminster Abbey they won't have to worry about it since guests will get shuttled from there to the palace in glamorous buses. But unless guests going to all the day's parties pack their sparkly nighttime things and change at the palace, they'll all have to figure out how to get home, change, and get back in a sea of excited — and by then, probably drunk — royal obsessives. She looked like Maggie Smith.